Since 2009, Deb has served our congregation by leading services, supporting members through her expertise as a licensed social worker and performing special ceremonies. Marti Livingstone will be at UUCGC the first and third Sundays of each month, working closely with our children and youth. Volunteers will lead weekly classes for elementary-age children based on Unitarian Universalist Tapestry of Faith curriculum. Marti is coaching the teachers and assistants, and sharing the real-life knowledge she gained as a fifthgrade teacher for 30 years. She is also busy organizing monthly activities for teens during services, and connecting with members and visitors with children to promote the YRE program. Together with parents and teachers, Marti will help organize and promote special events outside of Sunday mornings for youth of all ages. 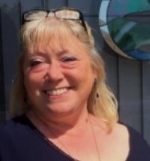 Marti graduated from Hiram College with a major in elementary education and a minor in vocal performance. She is currently program coordinator for Artful Living, a program that introduces the arts to under-served preschool children in Stark County. For her personal enjoyment, she teaches classes on history at Society for Creative Anachronism events; creates illuminated scrolls; sings and teaches rounds sung prior to 1600 CE; acts and directs theater productions; and performs as a storyteller. As a life-long Unitarian Universalist, I can trace my path to ministry back to growing up in a small, lay-led fellowship. Seminary began at John Carroll University in Shaker Hts., with a detour through Southern Methodist University in Dallas, and finally was completed at Meadville Lombard Theological School in Chicago. More than one person suggested that perhaps it was more of a “Gradual Degree” than a “Graduate Degree, but I have no regrets. Taking classes part-time in the evenings, allowed me to be home with my two children. Since ordination in 2003, I have served First Universalist Church in Southold, New York; the UU Church of Blanchard Valley in Findlay, Ohio and most recently , First Unitarian Church in Toledo, Ohio. My theological roots are unabashedly secular humanist. Today I simply call myself a Unitarian Universalist. In the course of any given liturgical year, I draw upon modern works of poetry, fiction, non-fiction and science, as well as ancient readings from all the faith traditions. If anything, I pull a bit more from modern Buddhists. Does this make me a UU Buddhist? No, but it recognizes that for those particular services I have found supporting wisdom within the Buddhist tradition. My husband, Tony Wilgus, and I have made our home in Oberlin, Ohio. Tony recently finished teaching Social Work at the University of Findlay, and is now focusing his time on writing, consulting, and serving on the Board of Healthy Congregations. Between the two of us, we are parents to five grown children and grandparents to six grandchildren, who live across the country in five states and three different time zones. Board meetings are usually held on the first Monday of the month from 6:30p to 8p. The meetings are open to the congregation. The meetings are held in the teen room at the back of the church. If you are going to attend a meeting, please come through the back door, causing less distraction to the NA meeting that is held in our sanctuary every Monday evening.